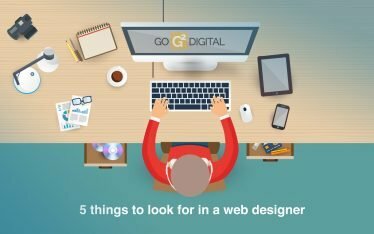 Making a great website has never been easier and there are hundreds of content management systems (CMS) that make a compelling case to forget hiring a developer altogether … If you decide to have someone do the work for you, here are 5 things to avoid when hiring a web designer. There are several important reasons to hire a website developer, or design agency to do the work for you. In a post I will cover in more detail later, the main reasons why people choose to have someone else do the work is a combination of time, money and experience. Often people are too busy running their business and want to ensure they have the best possible website for their budget. I’m really busy running my day-to-day business and I need to keep up with my competition in order to be successful, but I just don’t have the time to do it myself, and want to ensure it’s every bit as good as my competitors or better. I’ve often been asked to update an old website, or take over from a previous designer by an unhappy client who learned the hard way that their original choice wasn’t the best option. 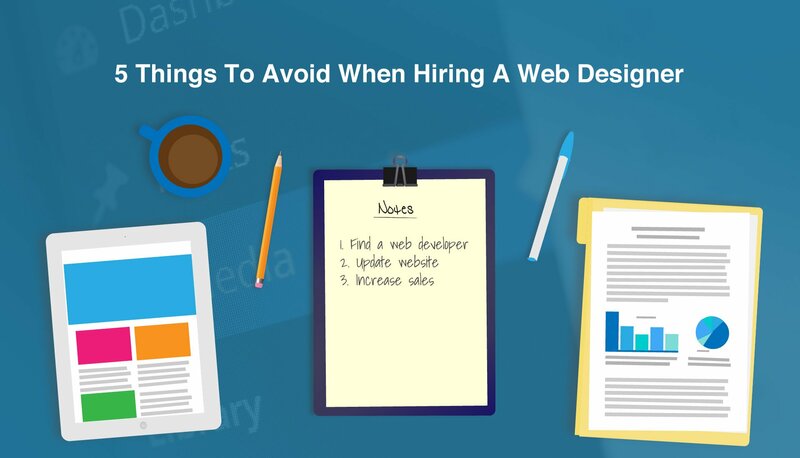 Here are some common red flags to avoid when looking to hire a web designer for your business. 1. They want you to sign a contract. This might seem counterintuitive, but the fact is that many developers will do this because a) they’ve previously had legal issues in the past, b) they are trying to lock you in so that leaving them will destroy everything you’ve paid for (so you won’t), and c) to turn over your digital rights to them entirely. One case I encountered recently was a small company with an outdated site that wanted something better after years of being drained financially and “held to ransom” by a firm whom they had signed a contract with. Fortunately, the company owner had the wisdom to purchase the domain himself, but under the terms of the contract any changes to the site would have to be made by the company he had signed with. All too often these contracts also involve web hosting, so the process of providing a fresh website for the client was a pretty difficult process. Because the original design firm had built a custom CMS system they also claimed creative rights, so no part of the website could be salvaged going forward. Knowing they had almost complete control over the company, design and hosting, fees were quite high and relations sour. 2. Developers who only give you limited access to the backend. Many designers won’t have you sign a contract, but instead will only provide limited access to the backend of the CMS system itself without you being aware that’s what is happening. Sadly, some developers will make you sign a contract and limit your access, but I digress. Having limited access to the backend is just that, limiting. As the owner of your business, you should have full access and ownership to your website. It’s as simple as that. The main reason developers will limit a company’s access to their own website is control. They want to ensure you need them and won’t give that up without a fight. Instead of being able to post your own content, you need to have them do it at a much higher cost than doing it yourself or having an employee do it once the site is up. Maybe there are a few technical or design issues you’d prefer a third party handle because the web design firm couldn’t get it right. There are several reasons for needing full access to the backend of a CMS as the owner of a business and you shouldn’t have to fight with someone in order to get it. 3. Developers who use custom made themes. Now there are a few extremely talented developers out there who make outstanding custom themes, but they are rare and often this will increase the overall cost of developing a CMS site considerably. The downsides are many, and often lead to several complications down the line. WordPress, for example, updates its’ core files quite often as they are constantly improving their product (and security features). Whenever a CMS system runs an update there is a risk that your custom website theme won’t be compatible and then suddenly crash. Custom made themes are also harder to integrate with other useful plugins, or components as they might not be adequately supported and there is no way to verify if they are or not until you cross your fingers and try. Want to install the best SEO software, or security suite? Time to hold your breath. A final reason to avoid a custom theme is that more often than not they just don’t look very good, or work well. Professional theme developers sell their work in trusted marketplaces like themeforest. They are updated constantly to comply with the latest CMS updates, and reviewed by other users. My advice? If you really want a custom theme, go there to find a proven development firm and request to either modify one of theirs, or create one from scratch that can be easily updated at competitive prices. Most theme templates are extremely customisable as well, so it’s not difficult to still have your site stand out visually. 4. Developers who put their branding on your website. If you’re going to pay a company to make a website for you, why would you let them put their brand on it? It’s your website and not a promotional piece for the people who made it. If a website developer did a good job creating your website, then give them a nice testimonial on their website, give them a few stars on their Facebook, or Google+ page, but your website is your business, not theirs. 5. Web developers who care more about their business than yours. A developer who spends more time selling than working isn’t working, they’re selling. If you have to go through a middleman every time you want to get some work done, you’re not getting any work done. You’re also paying the salary of the guy paid to keep you away from whomever it is that’s working on your website. Unfortunately, that person very well might be making $10 an hour (or less) in an overseas “design mill”. If this sounds like something you’ve encountered and you’d like some helpful advice on what to do next, or if you’re looking for a web designer who won’t do any of these things, inquire with G2!